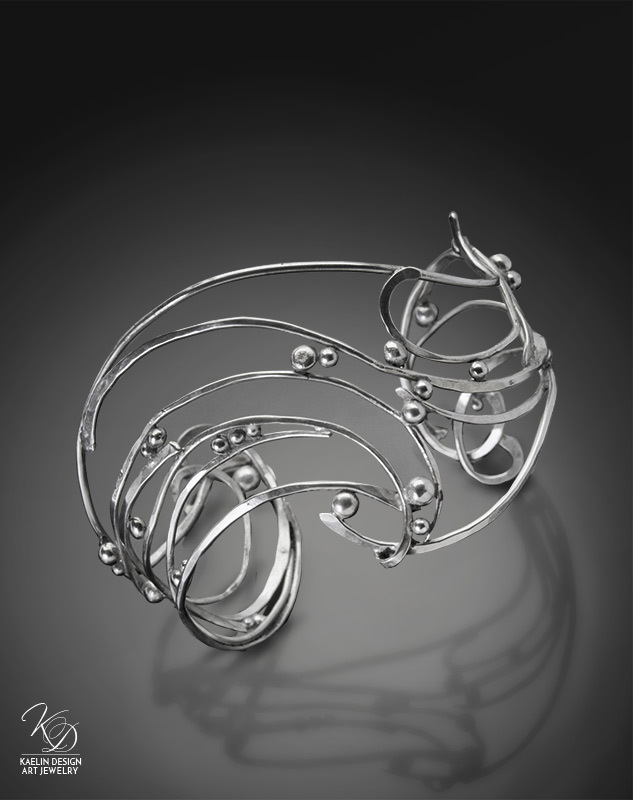 Hand Forged in Argentium Silver, this open cuff bracelet is inspired by the crashing of the waves. Stirred by the wind, and built on the tides, the waves roll unceasingly across the oceans. A voyage to unknown destinations, a search for treasure in exotic locales, and the serene play of moonlight upon the shifting seas... The waves have swept the earth in endless beauty since the dawn of time. Endlessly fascinating, awash with possibilities, and sparkling at every turn. I hand forged this one of a kind open cuff bracelet in my studio while drifting through a day dream of ocean waves. In my mind's eye, I remembered watching the waves roll beneath the bow of a sailboat, and crash against a rocky Pacific shoreline in a froth of bubbles and sea foam. How could I not forge silver waves awash with bubbles of shimmering silver?